John recently visited Tokyo and spoke at Joi Ito’s New Context Conference http://www.garage.co.jp/ncc2006. Joi is General Manager of International Operations for Technorati http://www.technorati.com, Chairman of Six Apart Japan http://www.sixapart.jp the weblog software company, and is on the board of Creative Commons http://www.creativecommons.org. Among his many accomplishments, Joi is also Chairman of iCommons http://icommons.org an organization dedicated to developing a united global commons front by collaborating with open content and free culture communities around the world. The North Fulton Drama Club in Atlanta, Georgia http://www.northfultondramaclub.org has a really innovative podcast that now includes Magnatune music. This dynamic local theater group produces it's own behind-the-scenes podcasts, covering everything from the challenges of performing Shakespeare to backstage goings on. Thomas L. Strickland, artistic director for the “upstart” theatre company recently contacted us about including Magnatune music in the podcasts. The club had been using podcasts to accompany production progress since April of 2006 and wanted music to enhance the shows. Since the play’s the thing, two of the podcasts were recorded for a spring production of Love's Labour's Lost. More have been produced for the group’s current show Twelfth Night, which just opened in October. In honor of the Hubble's Telescope’s 15th Birthday, The Ott Planetarium at Weber State University in Ogden, Utah put together a special show with Magnatune music. NASA took the highest resolution pictures ever obtained of two of the Universe's most-beautiful objects: the Eagle Nebula and the Whirlpool Galaxy. By projecting these amazing images on the planetarium dome along with the compositions of our artists, the show is undoubtedly awe-inspiring. Byrne's address was titled Record Labels: Who Needs Them? He answered the question by saying, repeatedly, that he believes artists still do need labels for their industry expertise, promotional know-how, and in some cases even their contributions to the creative development of an artist, but that labels and distributors must start structuring deals in a manner that is better for the artist. Byrne also compared major labels' use of DRM to the days of prohibition, observing that when enjoyable commodities are restricted, underground markets invariably develop. Finally, he discussed his decision to distribute some of his music under a Creative Commons license versus traditional copyright, saying that CC allows for better exchange of information and ideas. "And as we've seen," he concluded, "when information is restricted, society crumbles." 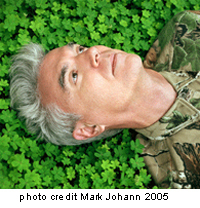 Byrne's next album will be released on Nonesuch, a label he described as very "artist centric." This year Byrne and Brian Eno collaborated with Nonesuch Records & EMI to offer their seminal album My Life In The Bush Of Ghosts. Originally released in 1981, and recorded 25 years ago, the new version has been completely remastered. In an innovative move, they are offering all the multi-tracks of two songs on the album for anyone to sample and remix. It’s quite encouraging to see well-known musicians jumping in and successfully using the same open principles as Magnatune.